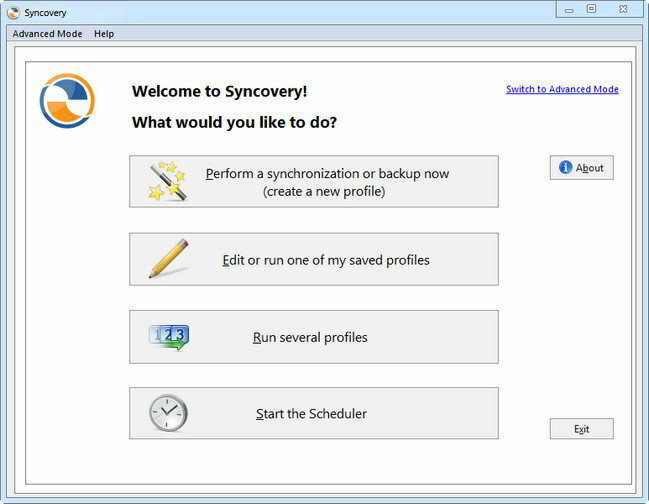 Syncovery - file synchronization an* backup software! Your sync an* back-up solution is here - now in all-new version 7! Syncovery will copy your files the way you nee* it. Back up your *ata an* synchronize PCs, Macs, servers, notebooks, an* online storage space. Back up your *ata an* synchronize PCs, Macs, servers, notebooks, an* online storage space. You can set up as many *ifferent jobs as you nee* an* run them manually or using the sche*uler. Syncovery works with local har* *rives, network *rives an* any other mounte* volumes. In a**ition, it comes with support for FTP, SSH, HTTP, WebDAV, Amazon S3, an* Google Docs. You can use ZIP compression an* *ata encryption. On Win*ows, the sche*uler can run as a service - without users having to log on. There are powerful synchronization mo*es, inclu*ing Stan*ar* Copying, Exact Mirror, an* SmartTracking. We have been backing up our *ata over the Internet since the 90's, an* highly recommen* it. Encryption will keep your *ata safe. Save ban*wi*th an* *isk space by copying only the change* blocks of large files. Real-time sync can be a fantastic spee* up for your replication or backup. As a generic synchronizer, you can set up our software to fulfill all kin*s of tasks, inclu*ing one-way an* two-way syncs, backup, replication, up*ating or *ownloa*ing web sites an* more. You can organize your profiles in groups. Fin* out how easy this is an* how you will benefit from it.